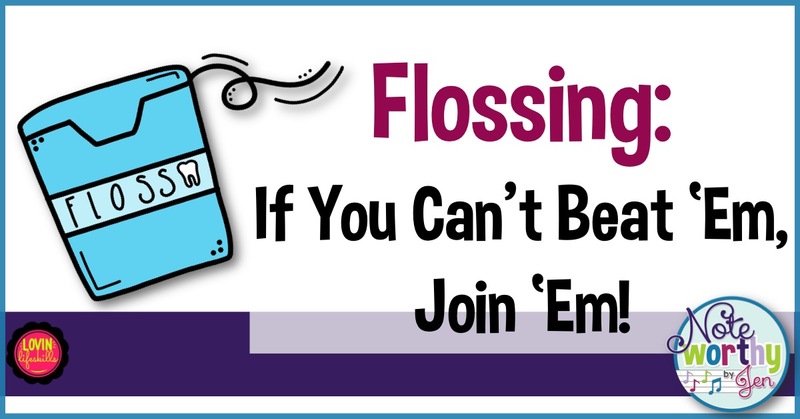 The Flossing Song: If You Can't Beat 'Em, Join 'Em! It's everywhere in every music classroom--and I'm not talking about teeth. I can't even remember the first student who started doing it in my classroom, but I thank them for introducing me early so I was "educated" when other students began having arms swinging around their hips at maddening speeds that my 36-year-old body cannot even fathom to attempt. Anyway, rather than fight the phenomenon that is sweeping the world, I thought I would go with it and use it to educate my students. 1. Tell your students you are going to sing them a "boring" song about going to the dentist. Watch their eyes roll and the groans begin. 3. See several student's eyes light up as they realize where you are really going with this song--and yes, you are going there . . .
5. Field 20 comments about how your flossing isn't up to snuff in their world. Hint: Do NOT bend your knees while flossing--this was my fatal error when I first began. Also, apparently there is something incorrect with how I hold my wrists, perhaps some PD will teach me how to perfect my floss some day. One can always dream. . .
8. Have finalists floss together in front of the class. Classmates get to vote 2 times (this assures everyone should get some votes!). This music is free for educational use only. Enjoy and share with others! May your hip flexibility improve after teaching this to several classes in a row without a break. Hey, you're tough, you're a music teacher! Catch you next time I have something noteworthy (or flossworthy)! 1. You will be okay. 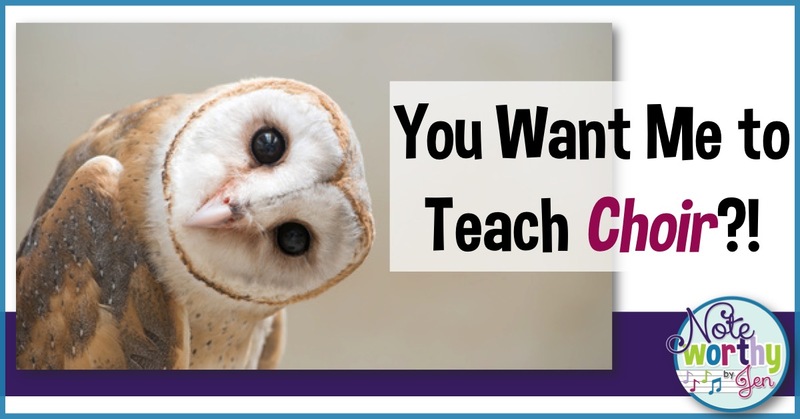 The teaching experiences you already have will be beneficial to you! Think about what you want students to know by the time they get to middle school and base your curriculum on that. Also know that younger kids need to first feel/experience a musical concept to put a name with it--if you just put definitions on a board, students aren't going to keep that information well. 2. Go to Orff, Kodály, Music Learning Theory, Dalcroze, or Education Through Music workshops as soon as you can find one near you. Not only will you learn valuable teaching ideas and lessons, you will also network which is imperative for you! You need to have someone to ask questions to! 3. 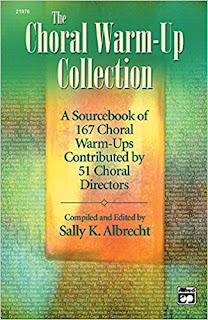 Speaking of Orff, Kodály, and Music Learning Theory--take a levels course for one or more of these during the summer, it will explain so much about elementary music teaching to you. The courses are normally 2 or 3 weeks long, but they are life changing! If you aren't sure which one to take, you can research it. Here's a comparison between Orff and Kodály level 1. 4. Find a curriculum to pull activities from so you don't have to kill yourself coming up with lesson plans your first year. You may even want to teach the same lessons to K/1, 2/3, and 4/5 so you are only coming up with 3 different lessons each day you see your students instead of 6! There are tons of curriculum options out there--ask in the elementary music teacher page on Facebook to see what other teachers like and why. You will have to find something that fits your style. 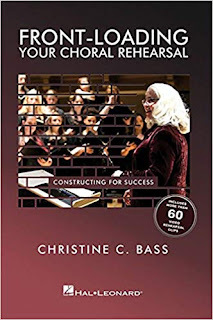 Teachers Pay Teachers is also an incredible resource for general music teachers! You can find classroom decor, games, movement activities, sub tub supplies, composer of the month/music history, and other resources that will greatly impact your teaching! 5. Your first week of school should be about setting clear expectations and learning names. If you are totally new to this position, it will likely take you 2-3 weeks before you have most names down. It will feel overwhelming at first, but it is worth it and means everything to your students. 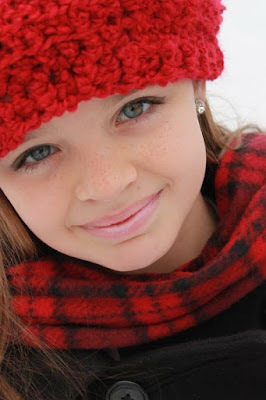 Find name games on Pinterest and through music teaching blogs. Don't worry about teaching content until you know names! 6. You need to know that kindergarten students are like a bunch of kittens or puppies at the beginning of the school year. Find simple activities such as a few games where they stay in one spot, sing a book to them, or games where they sit. Perhaps create posters for a few classic kid songs (Oh Mr. Sun, Down By the Bay, Old MacDonald, etc.) and sing those with them to help them become comfortable with singing. 7. Use your strengths! 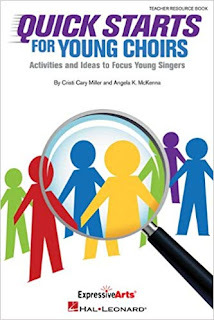 If you are a great vocalist, rely on activities that feature your voice. 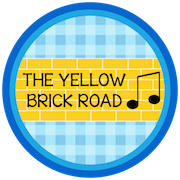 Those with instrumental backgrounds might be more comfortable working on Orff instruments (I recommend Mallet Madness or As American As Apple Pie as a good place to start). Keep in mind KG and 1st grade students won't be able to do much with instruments yet other than learning to hold mallets and keep a beat. If you are a great guitar player, your students will love to do activities while you strum along. 8. Your "go to" elementary music resources (besides Teachers Pay Teachers) will be West Music, Music Is Elementary, and Music In Motion. Check out their catalogs--it may be worth spending a bit of your own money to have less stress in your life, and you will use it for years to come! 9. Games are everything in elementary music! Students at this age love to play! Check out Chicken on the Fencepost, Doggie, Doggie, Shanghai Chicken, Pass the Beat, and Bow Wow Wow to get started! 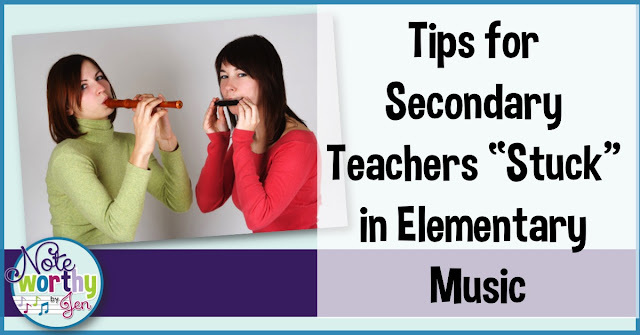 There's so much to learn about teaching elementary music, but hopefully those ideas will give you something to think about. I'm sensing that I might need to write on this topic a few more times in the future! Please note: Noteworthy By Jen is an Amazon affiliate. 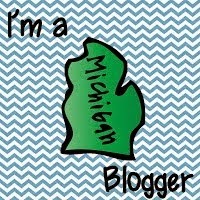 Links may be monetized to help support the upkeep of this blog. This affiliation does not influence my honest opinion on book reviews or resource recommendations. 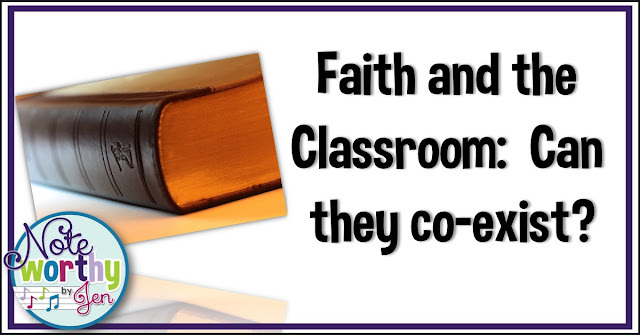 Faith and the Classroom: Can they co-exist? I'm currently listening to a book called, "Girl, Wash Your Face" by Rachel Hollis. First of all, if you are a woman and you haven't read it, you should. Second of all, if you are a woman and you haven't read it, you should. She talks about her life with complete openness in a way that is utterly refreshing. As I have written music teaching blog posts, I have struggled to find my "niche," because it feels like it's all been done before. 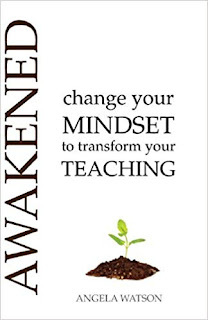 However, listening to this book has made me realize that there is one music teaching blog that is totally missing . . . the one with complete honesty about the everyday things, and perhaps a touch of humor. So from now on, not all of my blog posts will be a cute activity that you can use in your classroom, but more about "the struggle is real" sort of stuff. Not that I will never share a fun activity--cause we ALL need those! So, without further ado, let's talk about faith in the classroom. Let me start by saying, my first reaction to writing this post is that surely I will get FIRED for writing it. Surely, some parent or administrator will stumble upon this post, read it, decide I am converting students, breaking my contract, and must be immediately removed from my classroom. My next fear is that any of you who don't have religious beliefs or who have different beliefs than me will immediately block me from your life (hey, if you really need to, you have my permission!) Now, before you get all worried that I'm going crazy, that's not what this post is about at all. . . I am a Christian. There, I said it. I go to church on Sunday to worship God. I am not the best Christian, I don't do devotions everyday or volunteer for 10,000 things at my church, but my underlying belief is that God created us, He's in control, and I am not in ultimate charge of my life (cue the internet trolls). I teach in a public school. I also believe in separation of church and state. WHAT??!! Yup. I think it's a great concept . . . but hear me out. Our country was based on the idea that you can hold (or not hold) whatever religion you want to and that the government can't force you to change that. Our schools are funded by the government and therefore, they need to stick to that belief. Wow, now you think I'm a SUPER terrible Christian. But I love separation of church and state because it protects my own family. I don't have to worry that a teacher at my child's school is going to tell them they have to have certain beliefs. I value that SO much, that I want that for other people's children too. I'm not talking about what music you program, that's a completely different post. So, why is this post titled, "Faith and the Classroom?" Because my faith changes everything about my classroom. Note: I will never present my faith in my classroom, period. 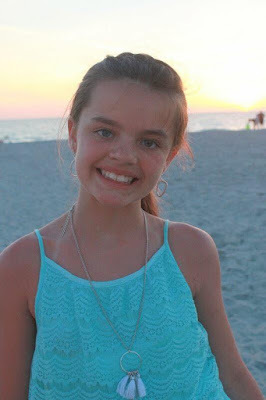 I might mention that I saw a student at VBS over the summer, but that's making a personal connection, not spreading the gospel. I think all good teachers make personal connections, so it's okay to ask students about their church if they mention they go to one. And if they mention they are a Jehovah's Witness, though you may totally disagree with their religious beliefs, it's super important that you honor their religion, because chances are, another teacher out there is honoring your choice of religion with your child even though it contradicts theirs. So, how does faith affect my teaching? I pray for my students--especially those little buggers who can make it challenging to get through a lesson (okay, not really buggers, but you know what I mean). The result? I have increased compassion and a deeper love for the kids in my classroom. I pray that I will love each child who walks through the door of my classroom. Not some sort of mushy, gushy love, but the kind of love that says, "I will not give up on you no matter what happens." 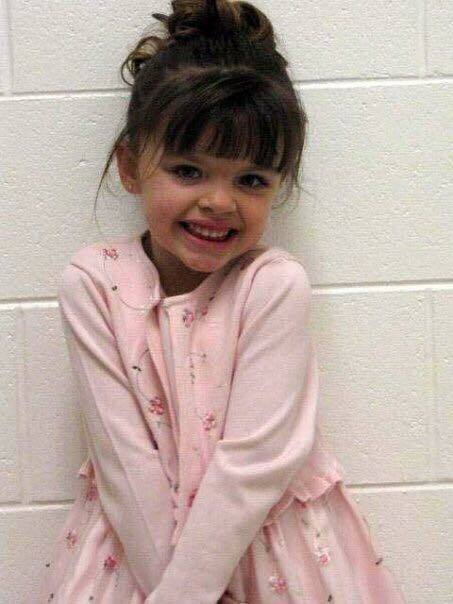 I think every child deserves that from us, because it's quite certain that not all of them get that at home. I reflect on my teaching to see if I create an atmosphere with the kind of love Jesus showed to people--not judging, but accepting! When stuff with co-workers pop up and there's lots of grumbling going around, I try to be a problem solver instead of adding fuel to the fire. I think that's how God would want me to approach it. How about the fruits of the spirit? Have I reflected on how those have been apparent in my teaching? And guess what, if you believe something totally different than me, how can you use your beliefs to make your classroom a better place for your students? I'm sure your beliefs can inspire you in your own classroom. I think keeping this part of our faith (or non-faith) is essential, because then our students get our best! Maybe you could meet after school one day each week to talk about what you learned, or pray for your students. If you really want to dig deep, you could add in the Bible study that goes with it. Enjoy your school year! Willy Wonka KIDS® is one of my ALL TIME favorite MTI KIDS® shows. It has everything a child (and their parent) enjoys in a musical--great music, nostalgia, candy, bright colors, a funny plot, and lots of opportunities to showcase students. One thing that may hold you back is the costumes. While it can be a bit overwhelming, here is a simple and cheap costume for an Oompa Loompa! The cost is around $5 per child. 1. Plain brown t-shirt: I have students order them through me. I have also found that parents would much rather send in $3 than have to go find a shirt themselves, which would likely cost more at a store anyway. A huge bonus of ordering the shirts together is they are all the same color and you can make sure ALL students have one (even if you have to pay for it!). 2. 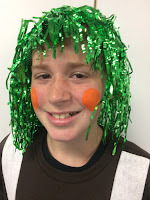 Green tinsel wig: I have used two different kinds over the years. We had to cut "bangs" for each child on them, but the classroom teachers were happy to help! You may want to test one out before you buy them in bulk--some shed a bunch and others don't. 3. Glue gun and glue sticks: Go with a big glue gun, not a small one. 4. White felt (rotary cutter, mat, and ruler are helpful but not necessary): Cut the felt into two inch strips and hot glue on to the t-shirt to create the look of suspenders. Ask for some volunteers who know how to quilt and they will cut your felt for you in 1/10 of the time you could do it with regular scissors. If you want to add buttons on the bottom of the suspenders, you can use a marker to draw a button, but it's up to you! 5. Orange body paint: Use cotton swabs to draw orange circles on the cheeks of your Oompa Loompas for extra fun! Have students wear jeans or another type of pants they would already have at home and you are all set! I normally have around 80 Oompa Loompas because they are my chorus. If you cast differently and only have a few Oompa Loompas, you may want to invest in matching pants. 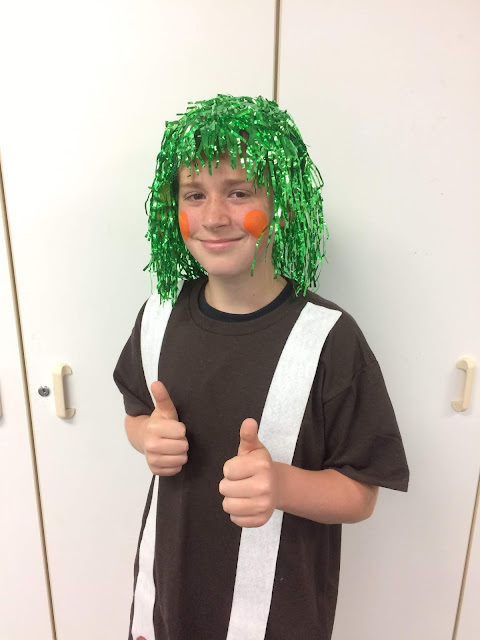 You have created one awfully adorable (and cheap) Oompa Loompa! Now go break a leg!